This article was originally posted in our Word @ Work Magazine in June 2016. 中文版. Since 2011, Bethesda Frankel Estate Church (BFEC) has been partnering with the Bible Society to customise Bible Mission Trips to China. BFEC organises two to three trips each year which are always oversubscribed. Most of the tour members are in their 60-80s and are largely English-speaking. We met with Elder Ong, who at 69 is still leading and organising trips to China, to hear more about his heart for the country and her people. He shares about the needs of the Church and gives practical advice about how to organise similar Bible Mission Trips for churches, families and friends. Share with us about your heart for China. How and when did it start? 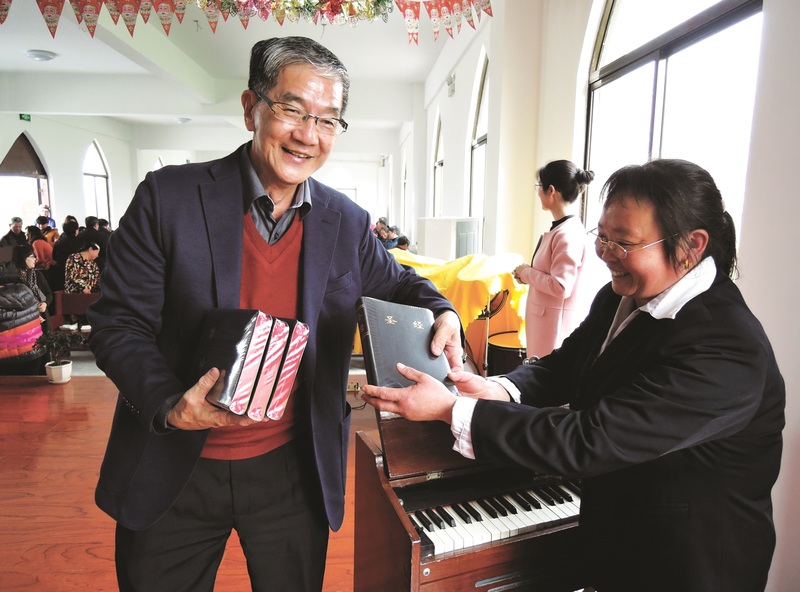 It first started in 1989 when I went with a friend to Xiamen to distribute Bibles through Every Home Crusade. It was there that I saw the need for Bibles in China. Your tour members are largely English-speaking. How is it like communicating with the Chinese communities you visit? We attach a person to those who can’t speak or understand Mandarin when interacting with the local believers. Language is not a barrier. People need to step out of the preconceived idea that they cannot communicate without knowing the language. Why are the tour members interested in the work in China? I believe that as English-speaking Chinese, they have a certain longing to learn more about China and go back to their roots. Also, they have heard a lot about China and the Chinese believers' passion for the Lord – they wanted to see the churches' condition in rural areas. We are so blessed as Singaporeans and we hope to give to the poor in our plenty. The members keep coming back for the trips. Any idea why? Firstly, they see the needs and experience the joy of giving a Bible to someone. They witness the tears trickle down upon giving the Bible – the locals really long to have a Bible of their own. Secondly, it helps them to reflect on their faith when they see how the people take God’s Word seriously and pray fervently. The locals come to church as early as 5am by cycling, walking or by bus even though the service starts at 8am! Lastly, the members feel welcomed by the church who would prepare hearty home-cooked meals for them after every service. Share with us some things you do on each trip. Before the trip, we assign duties to every member of the team so that all are involved – even in simple roles like the numbering of people, their luggage, to who does devotion or presents the gifts. We debrief after each location to hear fresh reflections from the members. Bible distribution is an important element in the trip and we ensure that each member gets to personally hand the Bible to the recipients. We also meet up with the local Christian council, visit seminaries and Sunday schools at churches, minister to the disadvantaged and help out in medical work. During our interactions, we share God’s love. On many occasions, members of the group were moved to help the locals when they saw the needs. What are some of the challenges you face when leading the trips? It’s a challenge to plan the programme so that it’s suitable for people of different age groupS. I go for each trip with fear and trembling because I am responsible for the big group. I really ask everybody to pray for safety and protection. We also have to be careful not to spoil the work that has already been done, as representatives of the Bible Society. How does your team raise funds to attend the trip and even give towards the Bible mission? Since this trip is about the Bible mission, each member is committed to contribute an additional $300 on top of trip expenses to support the work. Our church is very supportive. Though they are not travelling with us, members prepare food to raise funds for each trip. Any words to encourage others to attend Bible Mission Trips or organise trips to serve the needy? Take the first trip – no amount of words can explain the personal experience! You will experience God in every step you take, from finances to every matter involved. If you desire to do outreach in China, join us on our trips and learn how to lead!